We have woken up to an October where Hartford HealthCare and Anthem are no longer friends. On October 1, 2014, it was announced that Hartford HealthCare (HHC) hospitals and some facilities are no longer part of the Anthem Blue Cross & Blue Shield network, due to a breakdown in contract negotiations. If no deal is reached by November 1, 2014, even more facilities will fall out of network. It is promising that Connecticut’s officials are on the side of the consumer in this situation. But it is frustrating that consumers have no voice in this process when they are, arguably, the ones with the most at stake. As long as the fight between Anthem and Hartford HealthCare continues, consumers and patients are left to deal with an unfair level of uncertainty. Anthem members in the midst of receiving care from a Hartford HealthCare facility have been told to call Anthem to find out whether they may be liable for unaffordable out-of-network costs. Instead of focusing on their own health, they have to worry about getting bills they may not be able to pay. Where are the consumer protection measures to simplify this tangled situation? 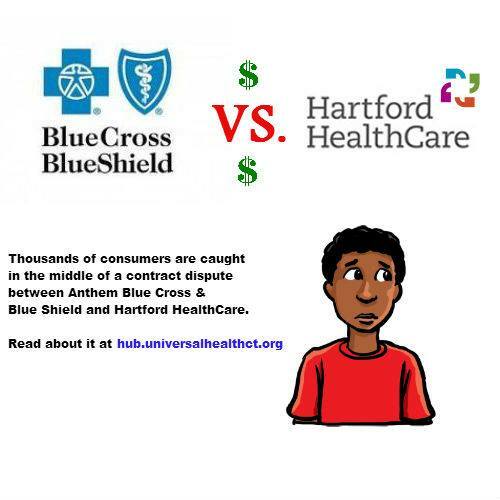 If both Hartford HealthCare and Anthem have failed to come to a resolution, why is the onus on the consumer to figure out what this means for their health and their wallet? The sheer size of the Hartford HealthCare network and Anthem’s large market share in Connecticut really matter. More and more hospitals and physician practices in Connecticut have become concentrated in just a few statewide networks. Meanwhile, despite some new entrants in the health insurance market, Anthem’s market share remains by far the highest in Connecticut. When two “juggernauts” collide, more people bear the brunt of the consequences. Consumers have little-to-no information about the negotiations happening behind closed doors. What little is known points to the fact that there are disagreements about what Hartford HealthCare will be paid, as well as Anthem’s efforts to tie those payments to quality. These are important issues to resolve, as consumers generally have little confidence that their health care dollars are being spent wisely. We hope that this contract dispute will be resolved very soon. But, in the meantime consumers deserve to be protected and have their voices heard. Are you insured via Anthem and wondering about your care? The Courant has 8 Things You Need to Know About Anthem, Hartford HealthCare Split. Hartford HealthCare has more information for patients here. Anthem has more information for consumers here. Residents can call the Office of the Healthcare Advocate at 1-866-466-4446 or the state attorney general’s healthcare advocacy unit at (860) 808-5318.